RadNet stationary air monitors measure gamma radiation emitted from airborne radioactive particles as they collect on the monitor's filter. The monitors transmit these real-time gamma radiation data each hour to EPA’s National Analytical Radiation Environmental Laboratory (NAREL). These data are viewable on the "Gamma Gross Count Rate" tab. Some RadNet monitors also measure ambient gamma radioactivity levels. These exposure rate measurements indicate the level of gamma radiation in the vicinity of the monitor. Exposure rate data are posted on the “Exposure Rate” tab, if available. The filters are also collected from each monitor and sent to the NAREL for gross beta air concentration screening and possibly additional analyses. The NAREL analytical results are viewable on the “Air Filter Analyses” tab. EPA posts monitoring results after checking to ensure they meet quality standards. To view individual data points shown on the graphs below, please use the query tool to search the RadNet database in EPA's Central Data Exchange for the hourly data, view the RadNet CSV File Download webpage, or query Envirofacts for the laboratory air filter analysis results. There may be gaps in the data due to telecommunication disruption, server unavailability, instrument maintenance/repairs, or other technical issues. The RadNet near-real-time data displayed on this website are taken from a mirrored server to reduce the wait time for display. Learn more about the mirror refresh schedule. Data are reported in Coordinated Universal Time (UTC). View official U.S. time and other time zones or convert to your local time on the RadNet CSV File Download webpage. View frequent questions about the RadNet monitoring program. RadNet stationary air monitors measure gamma radiation emitted from airborne radioactive particles as they collect on the monitor's filter. EPA uses RadNet monitors to track fluctuations in gamma gammaGamma rays come from many different radioactive elements, both natural and man-made. Gamma rays can penetrate several feet of concrete or a few inches of lead. Gamma rays can pose a serious health threat inside and outside the body and can be lethal depending on the amount received. Scientists use the properties of gamma rays to identify radioactive elements. radiation emitted from airborne radioactive particles at each of our sites. Tracking these changes over time gives a picture of the background (normal) levels and allows EPA scientists to detect any unusual changes. 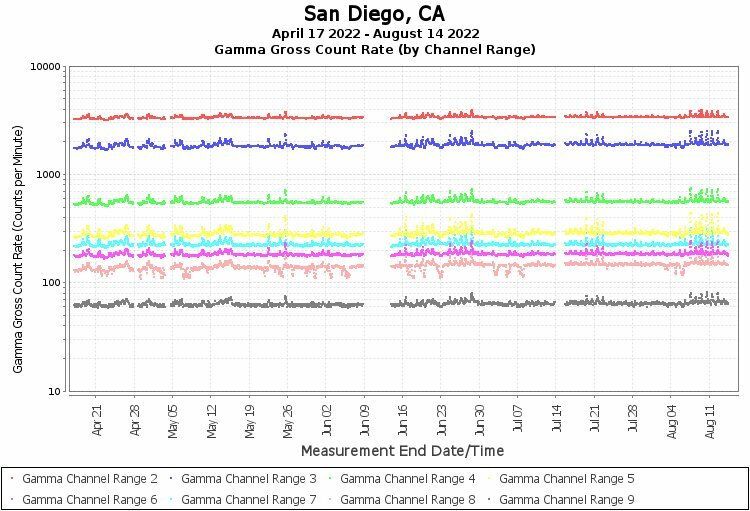 You can see a more detailed view of gamma detection across nine different channel ranges in our Gamma Gross Count Rate (by Channel Range) Graph. The Gamma Gross Count Rate represents how many gamma rays the monitor detects each minute. To view the individual data points shown on this graph, please use the query tool to search the RadNet database in EPA's Central Data Exchange. In an effort to make RadNet radiation data more understandable to the public and easier to compare with international data, EPA is adding exposure rate measurements to our other system capabilities. Exposure rate measurements indicate the level of radiation present per hour in the vicinity of the monitor. 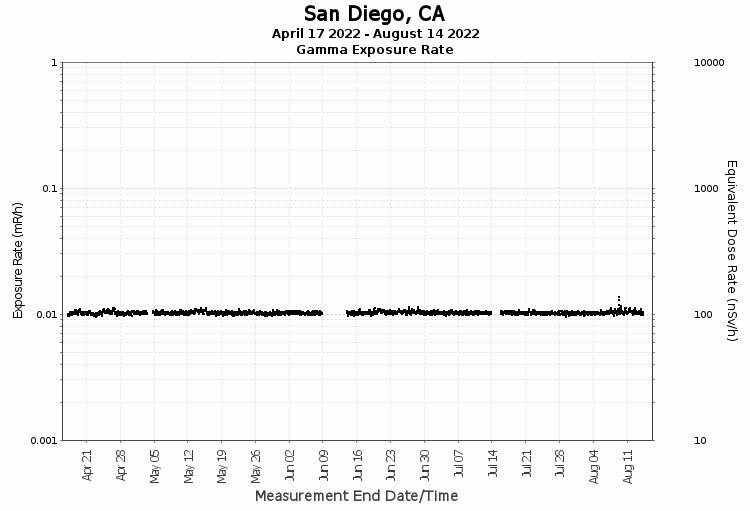 San Diego, CA began reporting exposure rate data on September 22, 2016. The left axis of the graph shows gamma exposure rate in US units of milliRoentgen per hour (mR/h). The right axis shows equivalent dose rate in the international units of nanoSieverts per hour (nSv/h), which is provided for easy comparison with international monitoring stations. To learn about typical dose rates, view About Exposure and Dose Rates. Air filters undergo three separate analytical processes, as illustrated below. 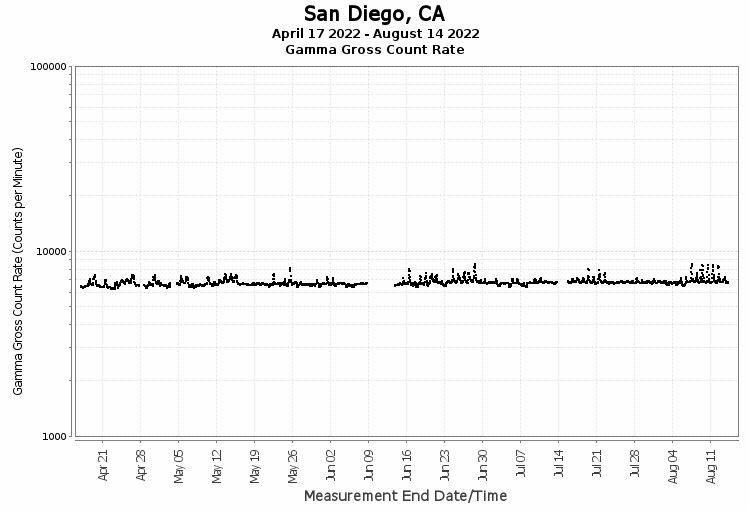 Results from the initial near-real-time measurements of gamma radiation emitted from particulates (Step 1) are posted on the “Gamma Gross Count Rate” tab. Air Filter Analysis results (Steps 2 and 3) are reported below in the conventional unit of curies (Ci) per cubic meter of air. Learn more about curies and the international SI unit of becquerel (Bq). Monitor operators change RadNet air monitor filters and send them to NAREL for analysis. A gross beta air concentration screening is performed at the laboratory on each filter, followed by gamma spectrometry if the beta activity is greater than the screening level of 1 pCi/m3. Following a known release, this screening level may be reduced and additional analyses may be performed. The graph below shows all beta air concentration filter results for this monitoring location. Gamma spectrometry results are viewable in the Radionuclide-specific Filter Analysis Results table below. Columns are sortable. See results key below. All air filters collected from a location for each calendar year are composited into one sample representing that location. The composite sample for each location is then analyzed by gamma spectrometry and on a four-year rotational basis for plutonium (Pu-238 and Pu-239/Pu-240) and uranium (U-234, U-235 and U-238). Annual composite sample analysis results are in the table below. Columns are sortable. See event key below. The radionuclide was not detected with 97.5% confidence. Either no result was measured or a result was less than twice the uncertainty level. The sample was not tested for this radionuclide. These air filters are not associated with any large scale radiological incident. Examples include analyses initiated in response to exceeding screening levels or analyses conducted in response to very low level detections by other international air monitoring agencies. Learn more about RadNet Air Filter Inquiries. At the end of each year, scientists combine all the air filters for each monitor and run gamma analyses. Alpha analyses are performed on the composites from one-fourth of the stations on a four-year rotating schedule. Air filter analysis results from July through December 1980 can be viewed in Environmental Radiation Data Report (ERD) 23 and 24. View ERD Reports. These air filters were analyzed in the 90 days following the Chernobyl Nuclear Power Plant incident. The results are not necessarily related to this event. These air filters were analyzed in the 90 days following the Tokaimura Nuclear Reactor accident. The results are not necessarily related to this event. These air filters were analyzed in the 90 days following the Cerro Grande fire, which threatened a historically contaminated site. The results are not necessarily related to this event. These air filters were analyzed in the 90 days following the fires at the Hanford Nuclear Reservation. The results are not necessarily related to this event. These air filters were analyzed in the 90 days following the tsunami that damaged the Fukushima Daiichi Nuclear Power Plant. The results are not necessarily related to this event. These air filters were analyzed in the 90 days following the Las Conchas fire, which threatened a historically contaminated site. The results are not necessarily related to this event. Note: All results (activity concentrations) have been radioactive decay corrected back to the sample collection end date/time (UTC).